We are students in Grade 5 and 6 at Dr. S.E. 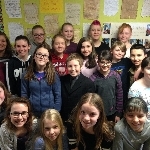 McDowell School in Shawville, Quebec who belong to the We Act Club in our school. We are passionate about making a difference in the world! On May 1, we will be silent for the entire day and are asking people to sponsor us in order to raise money for CHEO. Several of us go to CHEO on a regular basis, so we want to give back to this live saving hospital!